Fraud can come in many forms, from counterfeit checks to stolen credit cards and trusted employees to savvy hackers. For businesses, fraudulent activity is always bad news. 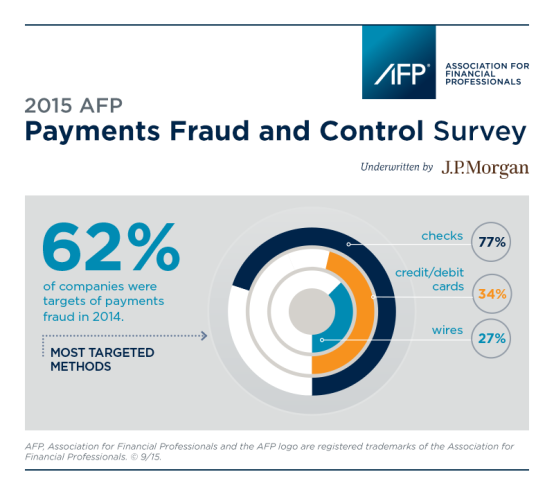 According to the Association for Financial Professionals’ (AFP) 2015 survey‡, 62 percent of companies were targets of payments fraud in 2014 with financial losses that ranged anywhere from a relatively small amount to millions of dollars. The good news for businesses is that there are numerous measures out there that can help prevent and detect fraudulent activity. In addition, advanced technology is being developed and deployed now that will help companies better protect their operations and their bottom line. According to the AFP, the most common form of fraud businesses encounter is through checks, corporate credit/debit cards and wire transfers. Paper checks continue to be the payment type most vulnerable to fraudulent attacks and account for the largest dollar amount of financial loss, even though their use continues to decline. Credit and debit cards are the second most popular form of business fraud, although they experienced a decline in fraudulent activity, down from 43 percent in 2013 to 34 percent in 2014. And lastly, wire fraud incidents almost doubled from 14 percent in 2013 to 27 percent last year. The newest form of fraud is cyberfraud in which criminals create an email account for corporate executives or vendors and send emails with payment instructions to employees in the accounting department. Employees who are unaware of the fake or altered email account will follow the instructions and make payment. While it may seem daunting, businesses can take steps to protect against fraudulent activity. Positive Pay‡ is one example of how companies can get ahead of the game. Positive Pay is an automated fraud detection tool offered by most banks. Here is how it works: Companies cut checks every month and send the bank a list of all those checks, including check numbers, amounts and payees. As checks clear against the account, the bank makes sure the checks match up, eliminating any fraudulent or altered checks. To protect against internal fraud, business owners should implement dual control and separation of duties. Understand who is in charge of what responsibilities on the financial side and make sure there are no gaps. Implement dual control over the businesses banking transactions, meaning the same person who is running payables should not be the same person who is reconciling accounts. Also, business owners should review financial statements on a weekly or monthly basis. To mitigate compromise in these areas, businesses should review all areas of their operation and put the proper preventions in place to protect against fraud. For instance, businesses should ensure their employees have the proper education and training for fraud detection. They should install, maintain and update spam filters, anti-virus software and firewalls. Reducing check writing, outsourcing payroll and having dual controls are additional tips that can help prevent fraudulent activity. In addition to being prepared, businesses will soon be able to rely on new technology to help protect against fraud. The latest and most anticipated technology is EMV (Europay, MasterCard and Visa) chip cards, which will have a major impact on lessening credit and debit card fraud. 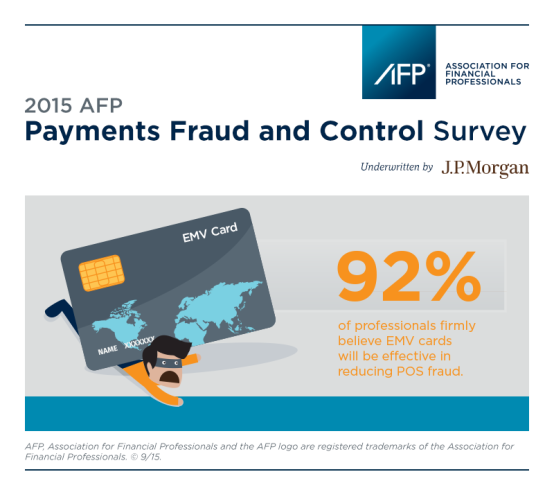 So much so that 92 percent of financial professionals believe EMV technology will be effective in reducing fraud at the point-of-sale. Traditional magnetic stripe cards require a signature for security purposes, whereas the new chip cards will add an additional layer of sophisticated fraud protection through an embedded microchip that turns the cardholder’s information into a unique code that is difficult to duplicate or copy when used at a chip-enabled terminal. Merchants and retailers are currently in the process of investing in new card reading technology that will accept EMV chip cards. If they do not update their technology, they could potentially be liable for fraudulent transactions and not the user or card issuer. Visa intends to institute a liability shift in the United States for domestic and cross-border counterfeit transactions effective Oct. 1, 2015. This shift will encourage Visa issuing banks to begin issuing EMV chip cards and merchants to begin deploying card swipe technology that can process the chip-on-chip transaction. While new technology and preventative measures can help businesses protect against fraud, the truth is that it will always exist in one form or another. What businesses can do is educate their employees, make sure they are using the most up-to-date technology and work with their financial partners to ensure the best practices and protective measures are in place.